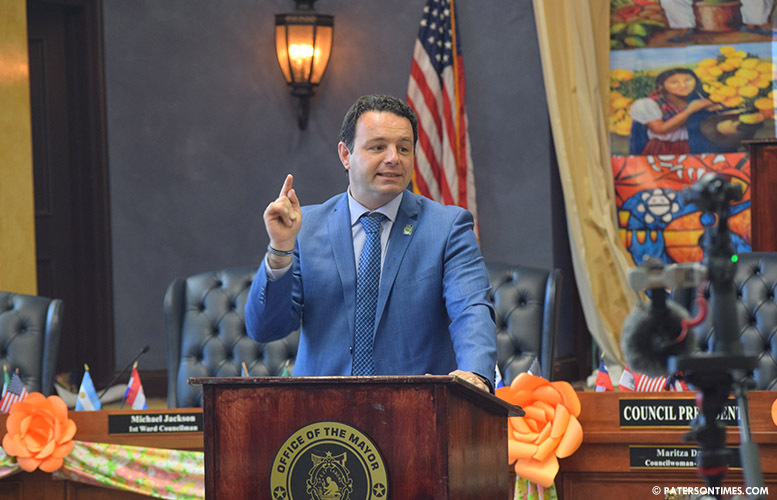 Mayor Andre Sayegh marked his hundred days in office by touting some of his key accomplishments. He delivered a 12-minute address listing some of his major accomplishments in office so far. Sayegh cited the move to the state health plan that will save millions, creation of a 100-person census committee, sale of the Paterson Armory, and the deployment of the “Clean Team” that created 20 part-time jobs for residents as some of his accomplishments in the past three months. “Good government” was the key theme of the mayor’s speech. He mentioned the switch to the state plan as an example of good governance. “Even though, at first, it may not have been popular, but for the taxpayers it was the right thing to do,” said Sayegh of the switch to the state plan. He said the switch will save $200 million in a seven-year period. Sayegh said he also fulfilled his campaign promise to leverage his relationships for the city’s benefit. He said he has been doing just that by meeting regularly with Passaic County officials and the superintendent of schools. He cited the recent move to study the feasibility of building a high-speed internet network to make the city attractive to high-tech firms as an example of his county relationships delivering for residents. But, the ultimate test as to whether his relationships are bearing fruit for the city, will be when the state delivers a transitional aid award letter to the municipality in the coming months. His detractors are patiently waiting to see whether the city gets $27 million, as it has in the past two fiscal years, or more. Some openly mocked the mayor earlier in the year and suggested the state is unlikely to significantly increase the city’s transitional aid award. Sayegh, who was one of the governor’s very early backers, remains optimistic. He touted his relationship with governor Phil Murphy during the campaign and in his inaugural speech. Murphy delivered a speech at Sayegh’s inauguration, repeating his promise that he has Paterson’s back. “Who is counting? In Paterson we’re not going to count the days. We’re going to make the days count,” said Sayegh. He may not be counting the next 100 days, but he was counting the past hundred. The speech was well-received by members of the City Council in attendance. Two of the nine members of the governing body attended. Council members Luis Velez and Ruby Cotton gave positive reviews of the mayor’s brief speech. “There’s a lot of other issues he has to address. There’s a lot of issues with quality of life,” said Cotton, 4th Ward councilwoman. She said the mayor needs to bring on more Community Improvement inspectors for weekends and nights to close down illegal businesses and crack down on other quality of life problems. “He’s on track of doing what the community is looking for. That’s accountability and making sure things get done,” she said. Council president Maritza Davila was walking into her office after the speech had ended. A reporter asked if she received an invitation to the mayor’s 100-day speech. Davila replied in the negative. “I didn’t know,” said the council president. She said she knew there was a celebration taking place to mark the 100-day, but was not aware of a speech. Davila said had she known about the speech, she would have left work at 1 p.m.
“We sent email invitations to the entire council,” said Sayegh when told Davila did not get an invite to his speech. The 100-day mark is usually celebrated with a speech, said the mayor. The mayor’s speech was attended by several dozen municipal employees and community leaders. Sayegh outlined some of the items his administration will tackle in the coming days, among them break ground on the massive ATP site renovation project at the Great Falls and clean up the contamination at the former Leader Dye site, sell it, and place it back on the tax rolls. “Paterson may have been forgotten in the past, but we’re going to remind people how great we are,” said Sayegh. Not since FDR has an elected leader gotten so much done in his 1st 100 days.